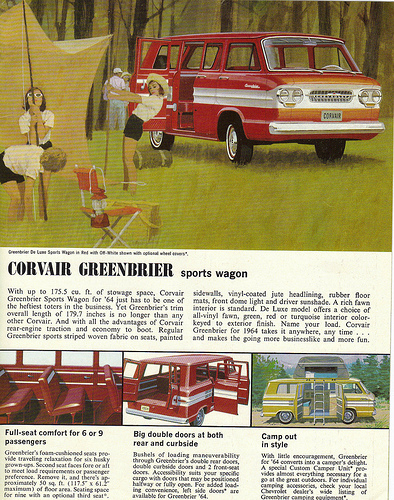 I grew up riding in Corvairs, including a Greenbriar van. That’s all my parents drove for years. By the time I was buying my own cars they were getting hard to find and even harder to find parts for. A first gen parked at the mechanic's shop down the block just last week. Nice condition too! I really liked the 2nd generation styling, we only had one of those, a ’65 (I think it was a Corsa), and I thought it kind of hearkened to the sharp-ended Corvette Stingrays but didn’t get you pulled over all the time. I got to drive that one and while it wasn’t the quickest whip in the neighborhood, it was pretty nimble. On top of it all this thing had 4 single-barrel carbs! How cool is that?! I was familiar with the dual-carbs, but this was a whole new level. My Dad was already a master at balancing two carbs without the aid of tubes or wires and 2 more didn’t faze him. The real workhorse over the years, though, was the Greenbriar panel van. No seats in the back, an astro-turfed plywood pallet covered the middle pit between the rear-mounted engine and the front axle some of the time. Ours was a panel van so no side windows. Bare-walled metal with the engine humped over the rear axle, it was loud in the back of that thing. Preferable, however, to being in the front seat. I never had any desire to drive it, in fact, it kind of scared me; you either bounced around in a deafening metal box dodging a sliding tool box in back, or placed your feet at about the spot a grill would be on any self-respecting car with a nose on it. The only advantage to driving it would’ve been access to the brake pedal. With all due respect to Sacred Bull’s driving, back then I instinctively stomped around trying to find one on the passenger’s side alot. That red and white Greenbriar rattled and gear-ground it’s way down the road – dependably – for many years. My Dad probably knew every bolt on that thing, engine innerds included, and knew how to keep it’s heart blatting. 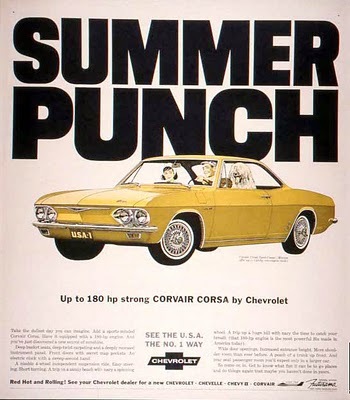 The last Corvair was made in 1969 and, as you can imagine, they become rarer as time speeds on. 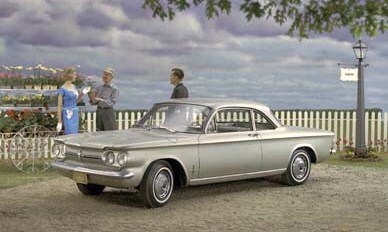 I hadn’t seen one on the hoof for a year or more when Aunt Bee brought home some pictures of a nice looking gen 1 parked at the repair shop next door. Prices online surpass the eldo’s worth quickly with well maintained cars selling in 5-figures.